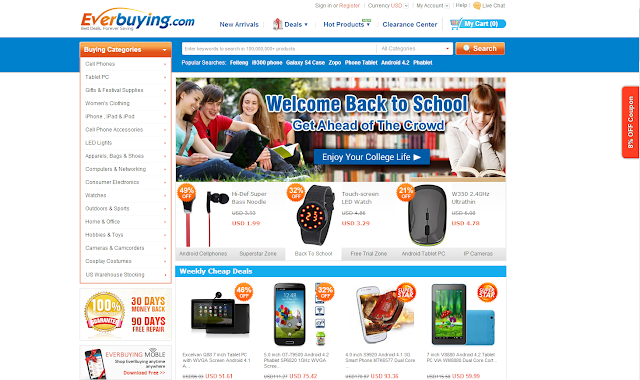 Everbuying.com (Useful Websites) ~ Android Forever! Almost nothing in life is sweeter than the process of searching for, finding, ordering, and of course receiving a new gadget. Whether it's a smartphone, tablet, accessory, or whatever, the joys of buying them are difficult to exaggerate. So when you find a web site that's well-designed, easy to navigate, and has great prices, you have to sit up and take notice. Here's a fantastic gem you may not have seen before. With deals aplenty and the gear you really really want, it's worth your time for sure. For example, this latest android tablet, is easily found and an exciting deal, right? The site has all kinds of phones, tablets and accessories, but that's not all. From clothing to cameras, memory cards to computer mice. you'll have fun searching, not to mention finding great deals. Click the button below to visit the site!